Ivanhoe After Hours March 11, 5:30-7pm, Cloak & Dapper 1219 N. Orange Ave.
Visit http://ivanhoevillage.org/ for more info. Note our NEW LOCATION at the Loch Haven Neighborhood Center. Topics for discussion/updates include the Alden Rd. Development, Ivanhoe Village Mainstreet, January elections, the Coyote invasion, Sellers Auto/Artist Studio petroleum cleanup site on Philedelphia Ave. AND MORE! Tues. Oct 21 7p @ Loch Haven Neighborhood Center, 610 N. Lake Formosa 32803. 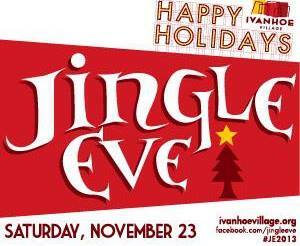 Ivanhoe Village is Orlando’s cultural hot spot and Jingle Eve is our largest event, spanning our entire Village from N Orange Ave (Princeton all the way down to Ivanhoe Row) and up Virginia Dr. The Beer Garden is made possible with the help of the Junior League of Central Florida and The Hammered Lamb. You’ll find Santa at D2 Productions, 1401 Alden Rd., right on the corner of Virginia and Alden. Interested in helping to plan Jingle Eve 2013? E-mail info@ivanhoevillage.org and put “Volunteer” as the subject heading. Interested in entering the boat parade on Lake Ivanhoe? Visit lakeivanhoeboatparade.com. entertainment, and more! Stretching along Virginia Dr. between Alden Rd. and Haven Dr. Enjoy a beer garden in the lot next to The Venue and a wine stroll that leads you from merchant to merchant.